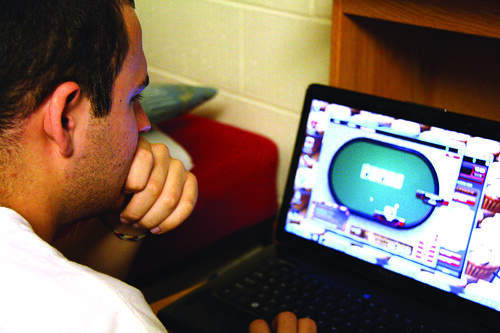 Zak Dombrowski a sophomore criminal justice major, and Jovan Hernandez, a senior human resource management major, are online poker players, and just may be part of a growing trend among college students in the United States. A recent study from the University of Pennsylvania shows the number of college-aged people participating in gambling is rising. In 2008, the number of male college students who reported playing online poker was 4.4 percent. In 2010, the number jumped to 16 percent. Dombrowski said he plays about three times a week but wouldn’t consider himself addicted. Dombrowski said he first used a Facebook application that advertised free online poker games before he switched to a more legitimate site that offers free starting cash in his account if he started playing with real money. “If you play money, they’ll double the amount you put in – for free. That was a really big incentive,” Dombrowski said. Party Poker, Pogo and Paradise Poker all allow people to play Texas Hold‘em, Omaha, Omaha Hi/Lo, Seven-Card Stud and Seven-Card Stud Hi /Lo with people from around the world without gambling real money. All it takes to access these games is a quick installation of the software and an account, but there is the temptation to use real money. Free sites often provide the option to gamble real money with an incentive of extra cash and other bonuses. One factor that certainly draws students in is the dream of making it big like Shawn Busse, the 21-year-old winner of this year’s 41st World Series of Poker bracelet and $485,791. Hernandez, is a friend of Busse and two others who have curtailed their college education to play professionally. In other words, poker is their main source of income. Hernandez still has a part-time job and only uses his hobby to augment his income. His plan is to finish college and find job security before he considers gambling professionally. Both students commented on the recent growth in popularity of the World Series of Poker. “It’s something you can watch where you don’t need to be an all-star athlete to compete and perform well. You can just be an average guy and want to learn this game and learn it well, and you can really do that if you set your mind to it,” Dombrowski said. One of Hernandez’s goals is to go to the World Series of Poker and win something, whether it happens next year or in 20 years. Rather than risk losing it all to more gambling, Hernandez has big plans for his future earnings. “I actually just want to get to the point where I can have a lot of money and invest it in something,” he said. In July 2010, Sen. Robert Menendez, D-N.J., sponsored a bill that would allow the Treasury Department to license and regulate Internet gambling and overturn the 2006 federal ban on the online sport. Both companies and individual winners would be taxed under the new bill, but it is still far away from becoming law. If taxed, online poker is projected to create $42 billion of revenue over a span of 10 years. Playing poker online lacks the interaction of live poker games. Dombrowski said the ability to catch someone easily in a bluff in live games is something he misses online. “It adds a whole other element because you’re there with people in person, and you can really read them, whereas on the computer, you can still get the same analysis of people, but you have to be more skilled,” Dombrowski said. Hernandez does not have any grievances with online playing. He said the game can be played the same way and that players can even learn to bluff online. He also pointed to online games as the destination for more experienced players. Both students recommend newcomers begin by playing free games or for very little amounts. Hernandez got his start by playing penny games online. He advocates the game over other gambling favorites, such as Blackjack, because it takes skill and practice to learn what moves to make rather than futilely attempting to beat the dealer or house. Incoming freshmen who join Facebook “class” groups for information and questions about their prospective schools often have personal information stolen. The Temple News didn’t want to feel left out of the viral phenomenon. Check out 25 things you probably never knew about TTN below. Montgomery urges Facebook users to reflect on their online image.